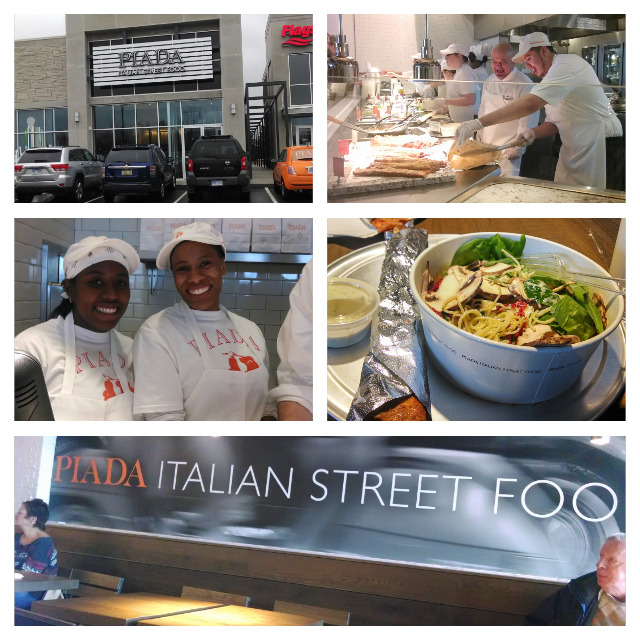 On November 22nd, I was invited to the Grand Opening celebration for the Piada Italian Street Food restaurant in Troy, MI - and greatly enjoyed the experience. Piada Troy is billed as a "new genre of fresh fare with Northern Italian roots." 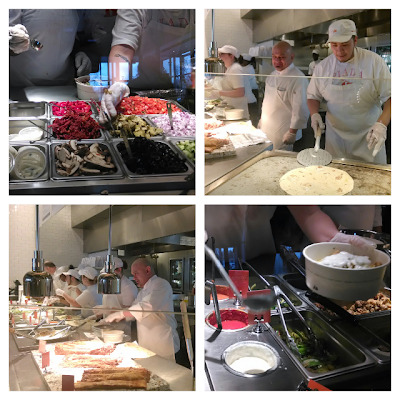 Customers at Piada get to custom build their meals as they go through a cafeteria style line and choose each fresh made-to-order dish. But don't worry about the meal assembly process taking too long since the super efficient staff at Piada typically complete each order within 60 seconds. I and everyone at the grand opening event (including the Mayor of Troy and the Troy City Council) were treated to a complementary meal so we could try out the Piada experience for ourselves. And the things that I love the most about Piada are that the portions are HUGE, the food delicious, and average meal price total less than $9. 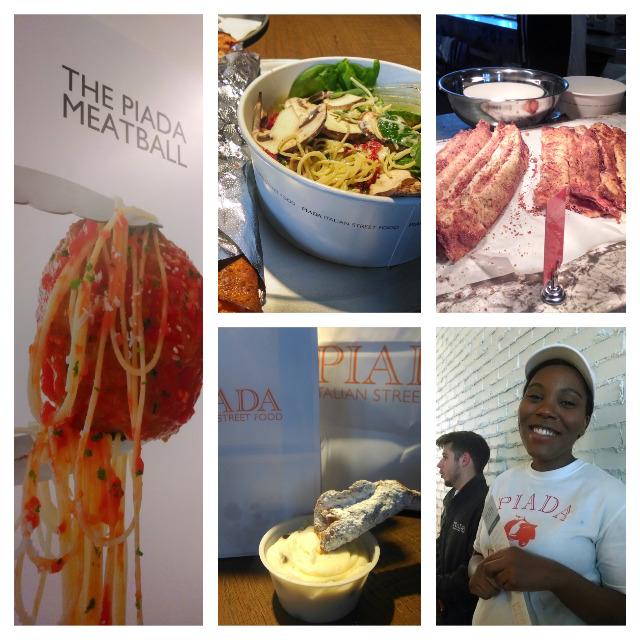 Piada Troy is also introducing a new Chef’s Menu highlighting items such as “The Piada Meatball Pasta” which features ThePiada Meatball — a 6 ounce meatball made with ground beef, ricotta, fresh herbs and spices — placed on a bed of angel hair pasta, covered with Pomodoro sauce and topped with Parmesan-Reggiano cheese. At the recommendation of the chef, I tried the Piada Pasta Bowl with chicken and loved every bite, including the fresh vegetables that I added. The Pasta Bowl portion was so huge that I had to take 2/3 of it home for lunch and dinner the next day. And the Pasta Bowl price is only $6.98 . I also tried the foot long Pepperoni Piada Sticks - which are a yummy, addictive bread stuffed with Pepperoni. I could have seriously made a meal out of just the bread stick, which is priced at $1.99. For dessert, I tried a bag of delicious Piada Cannoli Chips with chocolate chip cream. These cannoli chips are to die for and the $2.95 bag contains enough to share with tons of friends - or to keep and munch on for days. PIADA HOLIDAY GIFT CARD DEAL!!! With its tasty food and great low pricing, I highly recommend giving Piada Troy a try if you are in the neighborhood. And to sweeten the deal for the holiday season, Piada is offering a deal that my price wise readers should not refuse. 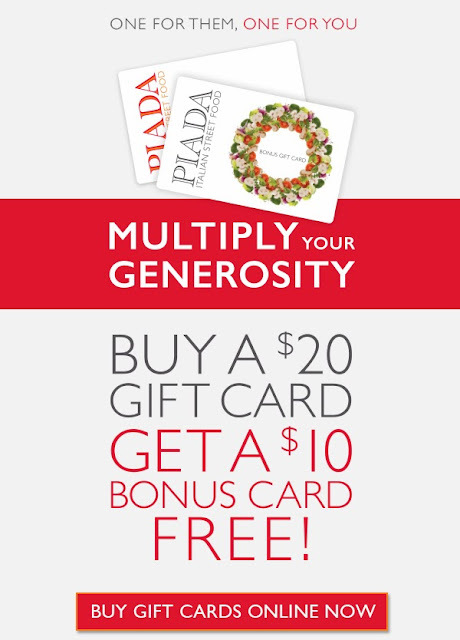 Go to Piada.com and purchase a $20 Traditional or Virtual Piada gift card online and you'll receive a $10 holiday bonus gift card during checkout! Offer is good until December 31, 2013. This is a deal that I don't plan to skip. And if you love great food at an excellent price, neither should you!